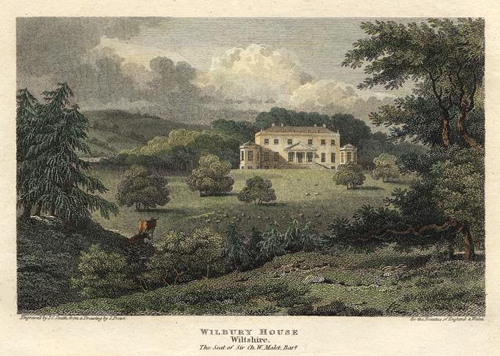 Wilbury House was begun in 1710 by William Benson.1 The name appears to have been composed of the Wil of Wilton and the bury of Amesbury, both being neighbouring houses, and both then believed to have been works by Inigo Jones. 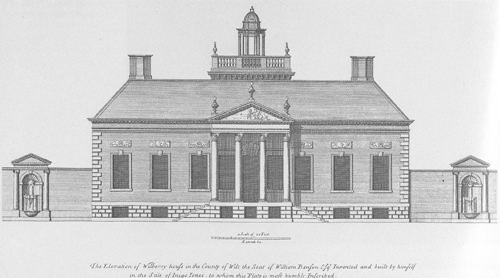 Benson had been the tenant at Amesbury, and he seems to have used this as his model for the new house. Not only did it cover the same ground area as Amesbury, but he copied the first floor of the south elevation and placed it on a low rusticated basement. This can be seen in the first volume of Vitruvius Britannicus, published by Colen Campbell of 1715, as can a plan of the ground floor. The plan, which seems to draw from Palladio’s Villas Pogliana and Sarego, is laid out in a characteristic T-shape of saloon (South Hall) and North Hall, with two small staircases filling the angles of the T. The four corners of the original building were occupied by two bedrooms (on the north), the drawing room (on the south-west) and the dining room (on the south-east). The attic rooms appear to have been staff rooms, and the basements housed the kitchen, cellars and other service rooms. The house changed hands many times from the early 18th century, passing through the ownership of Henry Hoare; Fulke Greville; Thomas Bradshaw and the Malet family. In the early 1870s, the Malets leased Wilbury to Percy Wyndham. 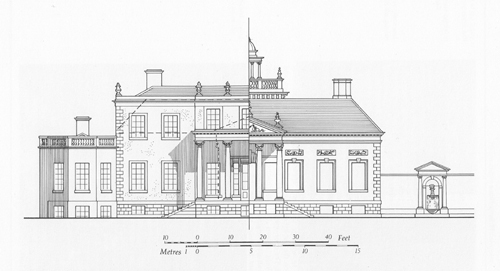 He and his family stayed for eleven years while their new house – Clouds, at East Knoyle, was designed and built. Lord St Just bought it just before the War and since 1996 it has been very sensitively restored by a new owner. I carried out the analysis of the paint in the South and North Halls and in a few other areas. My company Papers and Paints supplied much of the paint. The all-important introduction of Palladianism could be seen in the paint cross sections – the dark colours on the panelled walls of the South Hall being replaced by off-white in the mid 1750s. At this time the original bolection mouldings were prised off and the walls flushed. Papier mâché ornaments and plaster medallions were also introduced as part of the new look. 1 William Benson, was the brother-in-law of Henry Hoare I, and was in part responsible for the building of Stourhead.